My family has always eaten salads. When I was a kid, my salad consisted of cucumbers, with Creamy Cucumber dressing (which, of course, Kraft doesn’t make in the US anymore…but apparently you can still get it in Canada). I hated the lettuce–I just thought it tasted like nothing. Little did I know, Greek folks had been eating salads without lettuce long before I came along…I just didn’t realize that until I actually WENT to Greece. See, I like my salads with STUFF in them. Taco Salads, Black Bean Salads…drag it through the garden. The more junk the better. The greens in my salad are almost garnishes. My salads are dense, HEAVY things. I came up with the idea for the power salad when I was visiting Mom & Dad earlier this year. We all chip in to cook (this time even moreso since Mom had just had shoulder surgery), and it happened to be my job that particular night to make the side salads. I informed my parents that I would be making MY salad, and hoped they’d be okay with it. So, without further ado: This is MY power salad. YOUR power salad may differ. Heck, even my own differs depending on what I’ve got in the fridge. But I’ve bolded the “usual” ingredients. I urge you to try your own! *Second choices: Mixed Greens, Romaine, Other Fun Stuff. As mentioned before, Amanda Havard prefers Kale on hers, but to be honest I haven’t tried that yet. Would like to try both Kale and Swiss Chard. * Bell Peppers — I prefer red, gold and orange, diced. * I could go on forever. Any leftover veggie I have in the fridge is fair game. 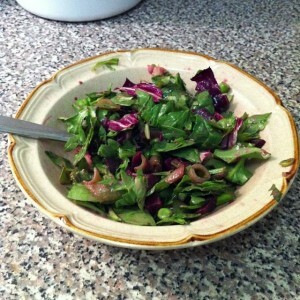 This salad may seem like a lot of work, but I assure you, it’s not. If you don’t cut everything directly into the salad bowl, use a separate plate — no need for cutting boards and the like, unless you’re going all out making salads for ten people. This entry was written by Princess Alethea and posted on November 16, 2013 at 8:00 am and filed under life. Bookmark the permalink. Follow any comments here with the RSS feed for this post. YUM Makes me hungry just reading this. Guess I’ll go see what’s in the frig.